Indianapolis scored three runs in the eighth inning to send the Louisville Bats to a 4-2 loss. 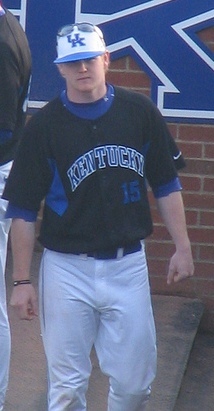 Left-handed pitcher Ben Jukich took a no decision despite surrendering just one run in six and two-third innings. The Lexington Legends recorded an 8-2 win over Augusta behind six shutout innings from right-handed pitcher Tanner Bushue. The Legends ace struck out four and surrendered just three hits. The Bowling Green Hot Rods scored four runs in the 11th inning to earn an 11-7 extra-inning win over South Bend. Three different Hot Rods tallied three hits in the game, and third baseman Julio Cedeno drove in four runs. Former UK left-handed pitcher and 2010 Twins draftee Logan Darnell took a no decision for rookie-level Elizabethton despite surrendering just three hits in seven shutout innings. Darnell struck out 10 and walked four. Former UofL infielder Chris Dominguez was 3-3 with a double and one RBI for low A Augusta. Lafayette High School alum Chaz Roe took a no decision for AAA Colorado Springs after surrendering four runs on 10 hits in six innings. ← Bats roster in flux for playoff run; Martinez still raking after promotion; Could Kearns stay in New York in 2011?